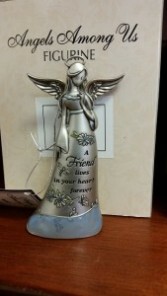 This metal angel stand approximately 3 1/2" tall and is inscribed with the words, " A Friend lives in your heart forever"
A beautiful jewel angel with a flower. 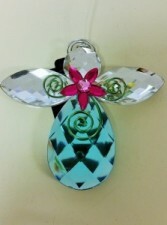 This acrylic angel is just under 4" tall. Available in the following colors: fuchsia body, lt pink flower dk purple body, lavender flower dk green body, fuchsia flower lavender body, dk purple flower dk teal body, lt teal flower lt blue body, fuchsia flower Please specify color choice in the addition information. (ornament stand sold separately. Flowers convey a message that cannot be put into words. Strickland's Floral & Gifts of Clovis, NM provides a variety of fresh, fashionable floral designs to ensure that your gift is one of elegance and beauty. When you're looking for a unique hostess gift, token of appreciation or just a surprise to brighten someone's day, let Strickland's Floral & Gifts customize and deliver one of our many fun, decorative & luxury gifts! We create dazzling presentations that are sure to please for any gift-giving occasion. 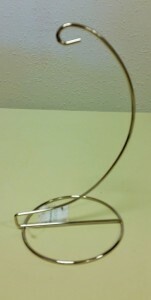 To get your custom gift items, come by and see Strickland's Floral & Gifts - your local Clovis, NM florist.